The Royal Coachman Motel is located on the Rogue/Umpqua National Scenic Byway in the heart of Shady Cove Oregon - the gateway to Crater Lake National Park. Take Interstate 5 (I-5) to Exit 30 (Crater Lake Highway 62). 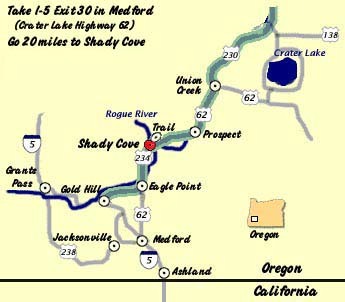 Go 20 miles to Shady Cove. The Royal Coachman Motel is on the right side just after you cross the bridge in Shady Cove.